Galion Graders pitcher Nick Muse stares down a baserunner during a 5-4 loss to the Lima Locos on Tuesday at James D. Heddleson Field at Heise Park. Muse pitched three shutout innings. Galion coach Ray Neill said Muse will be the Graders starter on Friday against the Lake Erie Monarchs. Galion’s Jake Krupar takes a lead off third base during the eighth inning of the Graders 5-4 loss to Lima on Tuesday at James D. Heddleson Field at Heise Park. The Graders were unable to score in the eighth and left two runners on base. Alexander Malinsky of Galion squares to bunt during the Graders 5-4 loss to the Lima Locos on Tuesday at James D. Heddleson Field at Heise Park. 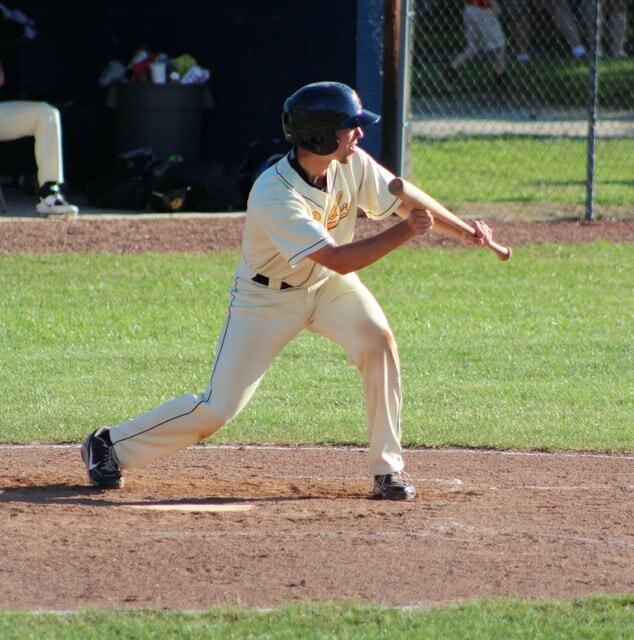 GALION — Chalk up another hard luck loss for the Galion Graders in the wake of a 5-4 defeat at the hands of the Lima Locos Tuesday evening at James D. Heddleson Field at Heise Park. Despite pounding out 12 hits, Galion (4-8) was its own worst enemy, committing five errors and leaving 10 runners on base. The Graders left two runners stranded in scoring position in the third, seventh and eighth innings. Sullivan (0-1) was saddled with the loss after giving up five runs on seven hits in four innings. Only one Lima run was earned. Galion committed three errors behind Sullivan in the first and second innings, contributing to the team’s collective woes. He shut out the Locos in the third and fourth innings before leaving the game. Sullivan recorded three strikeouts and one walk. A single and an error allowed Lima’s first two batters to reach base and Brett Murray slapped a double to left field that drove in both runners to give the Locos a 2-0 lead. Murray collected his third RBI of the game in the second inning as Lima extended its lead to 5-0. Luke Reynolds added a RBI double and Will Kilgore had a sacrifice fly for the Locos. After the rough start for Sullivan, the Graders bullpen held Lima in check for the rest of the game. Nick Muse was dominant during his three-inning stint. He struck out four batters and walked one while holding the Locos without a hit. Josh Peterson and Ben Hamilton each pitched one shutout inning. In his last five innings pitched, Muse has not allowed a hit or a run and has recorded seven strikeouts and just three walks. In five appearances this season, Muse has a 5.40 ERA. His good work over the past week hasn’t gone unnoticed. As the bullpen did its work, Galion chipped away at the Lima lead. J.T. Core’s single in the third drove in Nick Riotto to cut the deficit to 5-1. Tyler Ocker’s ground-out to shortstop in the fourth allowed Jake Krupar to score and cut the gap to 5-2. Riotto and Core combined once again in the seventh to put a run on the board. Riotto slapped a double to left field and scored when Core laced a two-out double to left field that trimmed the Lima lead to 5-3. In the ninth, Riotto led off with another double, this time to the gap in left center field. Mark Delas punched a single through the right side of the infield that drove in Riotto and pulled the Graders to within one run, 5-4. Unfortunately for the home side, Krupar hit into a double play to end the game. Murray led the Lima attack, going 2-for-4 with three RBI. The Locos (8-5) finished with seven hits. Tyler Miller (1-0) picked up the win for Lima. He worked three innings and gave up two runs on four hits. Miller recorded four walks and three strikeouts. Seth Kinker pitched two innings to earn the save. His stat line read one run on four hits with one strikeout. Riotto continued to have the hot hand for Galion, going 4-for-4 with a pair of doubles and scoring three runs. He also drew a walk. Riotto is now batting .533. Core went 3-for-5 and drove in two runs. Delas and Ocker each had a RBI. The two teams will meet again Wednesday at Simmons Field in Lima. First pitch is set for 7:05 p.m.
Will Ore (2-1, 2.45 ERA) is scheduled to pitch for the Graders. Lima will send Travis Edgar (0-0, 5.78 ERA) to the mound. Galion travels to Flat Rock, Mich., on Thursday to face the Lake Erie Monarchs. Lake Erie visits Galion on Friday.